It wasn’t supposed to happen this way. Justin Williams was supposed to come to Washington, with a little encouragement, skate with Alex Ovechkin and the rest of the Capitals, work his postseason magic, beat back the Game 7 demons that have haunted this franchise, and hold aloft the Stanley Cup at a celebration on Pennsylvania Avenue on a sunny day in mid-June with thousands of long-suffering Caps fans cheering wildly. That was the plan in July 2015 when Williams signed a two-year/$6.5 million contract. At 34 years of age, it might have been his last best shot at a Stanley Cup. For the Caps, he was a solid veteran who could provide the depth they lacked at right wing in 2014-2015. And he did not disappoint in the 2015-2016 regular season, scoring 22 goals for his new club. He had not scored more in a season since he had 33 in 2006-2007 for the Carolina Hurricanes. But the playoffs were another story. He did have three goals in 12 games, but his minus-3 was the first time he finished a postseason as a “minus” player since his first appearance in the playoffs, in 2002 with the Philadelphia Flyers. It was another second round exit for the Caps, a case of the Caps Curse overcoming the Winning Ways of Williams. 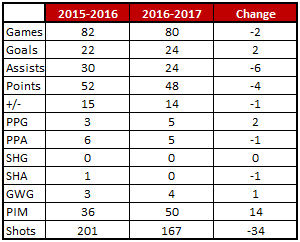 The sameness of the 2015-2016 season among the seasons that preceded it in Caps history gave the 2016-2017 season a heightened sense of urgency. It would be the second year of what was identified by Caps General Manager Brian MacLellan in February 2016 as a two-year window to win the Stanley Cup. Part of the reasoning was that Williams would be in the second and final year of his contract with the Caps, and with salary cap and age issues looming did not appear to be a strong candidate for another deal with the club. For Williams, 2016-2017 was something of a roller coaster. He got off to a sluggish start, posting just one goal and one assist in each of his first two ten-game splits. Part of the problem was a shooting issue, specifically volume. In those first 20 games he did not record a goal in a game in which he had fewer than four shots. Unfortunately, in 16 of those first 20 games he had fewer than four shots on goal. Things picked up in a big way for Williams over his next three ten-game splits, recording 15 goals on 63 shots, three of the goals of the game-winning variety. That the Caps went 20-6-4 in those 30 games was probably not a coincidence. Williams couldn’t sustain that pace, though, and slipped in his next two ten-game splits, going 2-7-9 in 19 games before coming on at the end with a productive 5-5-10 scoring line in his last split (11 games played). Fearless’ Take… All in all, Williams had a more productive second season, goal scoring. He was up a pair of goals, to 24, despite recording 34 fewer shots on goal (a 20.4 percent drop). As one would expect, getting the next-level scoring from a player like Williams matters. Washington was 19-1-2 in the 22 games in which he recorded a goal. He was especially hard on the Metropolitan Division. In 30 games against teams in the Met, Williams had 12 goals. In 50 games against the rest of the league, he had 12 goals. Cheerless’ Take… What’s that thing about the dealer hitting on 16 or lower in blackjack? Something like that went on with Williams and his ice time. The Caps were 45-18-8 when he skated less than 17 minutes, 9-6-1 when he skated more than 17 minutes. Odd Williams Fact… shots on goal didn’t matter for Williams insofar as losses were concerned. The Caps lost nine games in regulation in games he recorded more than one shot on goal, and they lost nine games in regulation when he recorded one or no shots on goal. It was four extra time losses when he recorded two or more shots, four extra time losses when he recorded one or no shots. The difference was in the wins – 32 when Williams recorded more than two shots on goal, 22 when he didn’t. 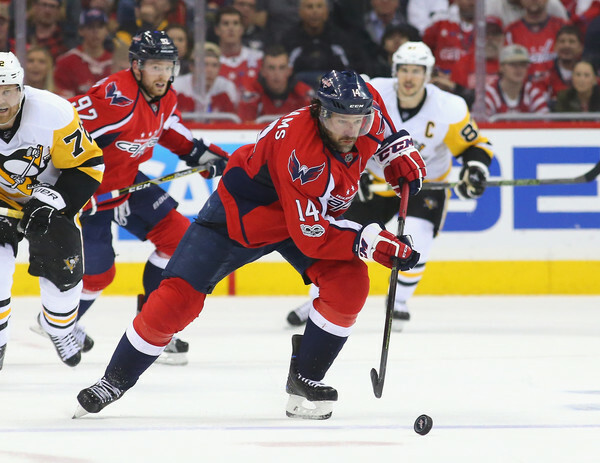 By the time the Caps reached Game 81 of their schedule, they clinched their second consecutive Presidents Trophy and were trying to stay sharp for the postseason. It was the last game of their road schedule, and they were looking to extend their road winning streak to three games and six wins in their last seven road contests. The Caps broke on top less than five minutes into the game when Williams and Marcus Johansson broke into the Bruins’ zone and played a give and go, Williams returning the puck to Johansson with a soft saucer pass that Johansson converted into a backhand shot past goalie Anton Khudobin’s left pad. The teams exchanged goals less than a minute apart in the second period. Before the period ended, though, the Caps got some insurance from Williams. With less than a minute left in the period, the Caps won a faceoff in the Bruins’ end. Marcus Johansson nudged the loose puck to Williams, who fed it through the referee’s legs to Nate Schmidt at the left point. Schmidt fired a slap-pass to Evgeny Kuznetsov backing into the right wing circle. As he was doing so, he one-timed a pass to Williams who in turn one-timed a shot past Khudobin to finish a nice tic-tac-toe play with 49.3 seconds left in the period. It was Williams’ 100th point as a Capital in what would be his last regular season game of the campaign. Playing the back half of a back-to-back set of road games, the first of which was a 3-2 win in Chicago over the Blackhawks, the Caps were facing an old foe and for Williams a former team. Things started well enough for the Caps as Evgeny Kuznetsov scored 12 minutes into the game. It went south, so to speak, in a hurry after that. Carolina scored 35 seconds after the Kuznetsov goal and again less than five minutes later, Williams on ice for both Hurricane tallies. It didn’t stop until the Hurricanes scored an empty net goal with 3:50 left in the third period on their way to a 5-1 win. For his night, Williams had just one shot attempt (missed) and won the only faceoff he took. There were no other marks on his score sheet but for the minus-2, and his 9:38 in ice time was a season low. Let’s face it. Justin Williams was signed for a number of things, but one stood out, his record in Games 7 of the postseason. 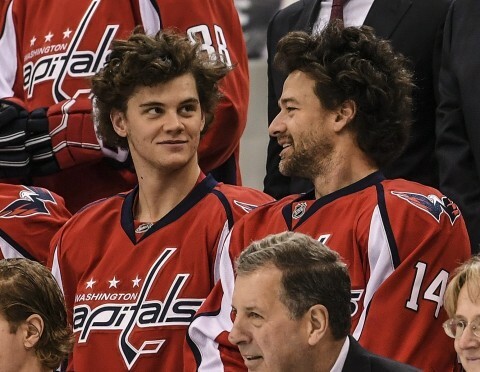 He arrived in Washington with seven goals and seven assists in seven career Games 7, all of them wins. In 2016 the Caps did not appear in a Game 7, but if they were to make a deep run in the 2017 postseason, one had to think the Caps would face a Game 7 at some point. It did not come in the first round against the Toronto Maple Leafs, against whom Williams was a fine 3-3-6, plus-2, in six games. In the second round, though, he scoring pace slowed against the Pittsburgh Penguins. He had three assists in the first four games, but the Caps fell behind, three games to one. Washington scratched out wins in Games 5 and 6, but Williams did not record a point in either of them. It set up the ultimate irresistible force meets immovable object scenario – Williams’ record in Games 7 versus the Caps’ record in Games 7. We know how that ended. Williams skated 19:51, the most ice time he logged in the series, but he – along with the rest of the team –did not record a point in the 2-0 loss, and the Caps Curse of Games 7 lived on at the expense of one of the legendary Game 7 records of an individual player in NHL history. It was a story that didn’t seem to last quite long enough or have as happy an ending as we might have hoped.